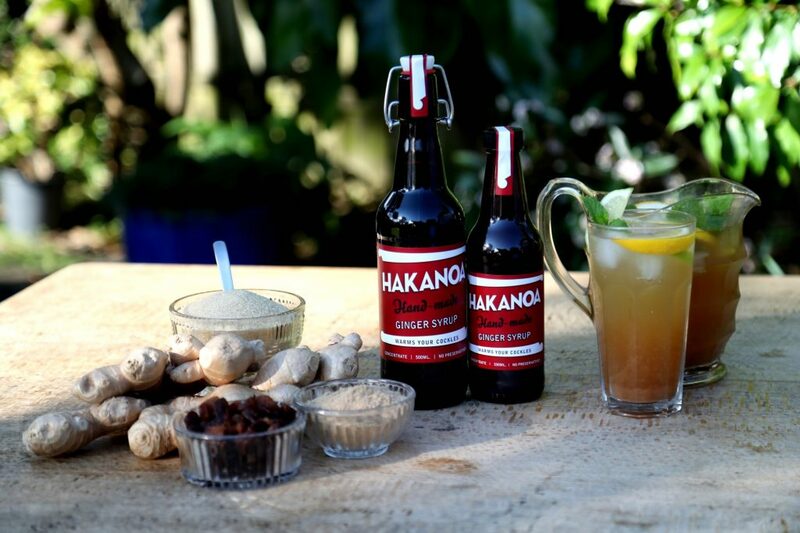 HAKANOA GINGER SYRUP TASTES LIKE GINGERBREAD IN LIQUID FORM. UTTERLY DELICIOUS & INCREDIBLY VERSATILE. TRY IT TRICKLED ON ICECREAM OR PORRIDGE, OR USE IT IN BAKING & PRESERVES. USE IN PLACE OF FRESH GINGER IN MARINADES, STIR-FRIES, DRESSINGS, DIPPING SAUCES & MORE. HOT GINGER TODDY – 30mls SYRUP & A WEDGE OF LEMON IN A CUP OF HOT WATER. GINGER FIZZ – 30mls SYRUP & A WEDGE OF LEMON IN A GLASS OF SODA & ICE. This delectable concoction is a ginger-lovers dream. It is dense with 48% ginger, carefully filtered to produce a silky rich syrup that warms you right down to the cockles of your heart. This stuff is incredibly versatile – it’s a cordial, a condiment, and a cooking ingredient. It’s also rich and smooth and delicious – try to imagine liquid gingerbread. Wonderful diluted in sodas, or in hot water, in hot toddies, and especially good dissolved in hot frothy milk. Yes – hot milk! It’s a very soothing concoction. Dangerously good trickled over ice-cream, pancakes, porridge or yoghurt. Fabulous in salad dressings, marinades, and stir fries. Brilliant in baking and smoothies. FILTERED WATER, , ORGANIC FAIRTRADE RAW SUGAR, FRESH FIJIAN GINGER ROOT ORGANIC SULTANAS, ORGANIC FIJIAN DRIED GINGER, NZ LEMON JUICE – NOT FROM CONCENTRATE. PRESERVATIVE-FREE, SULPHITE-FREE, DAIRY-FREE, & GLUTEN-FREE. THERE’S ONLY FOOD IN OUR FOOD. Download a printable recipe leaflet.